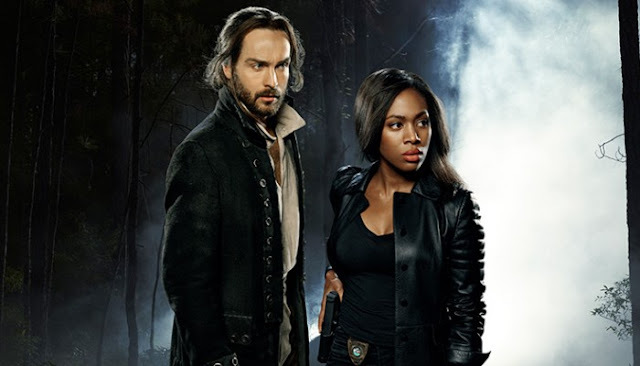 Imagine Moonlighting without Bruce Willis, Laverne without Shirley, Hart to Hart without Robert Wagner, Sanford and Son without Redd Foxx and you'll understand the predicament Fox has placed Sleepy Hollow in. The embattled supernatural show is returning for a fourth season despite declining ratings and without its co-lead, Nicole Beharie. Half of the reason you watched Sleepy Hollow in the first place, Beharie's Abbie Mills, was killed off in the season 3 finale. After an onslaught of cancellations throughout the television landscape, shows with much higher ratings than 'Hollow' were axed, yet somehow the show is being brought back despite losing the glue that kept it remotely watchable year after year. As an audience, we were sold a bill of goods. The show was built on a shaky premise to begin with. It's loosely based on Washington Irving's 1820 short story "Legend of Sleepy Hollow," wherein the creepy titular spook-filled glen, schoolteacher Ichabod Crane is whisked away presumably by a Headless Horseman who was killed in some unnamed battle of the American Revolution. On the show, Crane (Tom Mison) dies in a similar battle only to awake 250 years in the future where he must solve a mystery dating back to the founding fathers. Due to a blood spell cast on a battlefield during the Revolution, the infamous headless horseman is revived along with Crane, and the murderous rider embarks on a bloody rampage in present-day Sleepy Hollow. Ichabod realizes that he must act quickly, for the headless horseman is only the first of the Four Horsemen of the Apocalypse. Detective Abbie Mills, a woman familiar with supernatural experiences, forms a bond with Crane as they try to stop an increasingly vicious cycle of evil. Sounds good enough for one season but despite the ever-changing convoluted plotting, one thing was certain the chemistry between Mison and Beharie was unmistakeable and electric. One of the toughest things to manufacture in acting is chemistry and Fox had stumbled on it in abundance. Your leads either have it or they don't and Mison and Beharie had "it." The other remarkable aspect of the show was the diversity of the cast. Obviously, 'Hollow' had a smart beautiful black woman detective in Beharie playing against the handsome fish-out-of-water and time Brit in Mison but the supporting actors were also refreshingly diverse. John Cho had a recurring guest role as a police officer who turns to be in cahoots with the evil demon Moloch and Nicholas Gonzalez had a small thankless role as Mills' creepy ex-boyfriend. Later the show added Abbie's sister, Jenny (Lyndie Greenwood), FBI agent Sophie Foster (Jessica Camacho) and there was Captain Frank Irving (Orlando Jones) whose role changed every season. Again, the writing was all over the place but the cast was representative and solid. In doing so, the show had a more diverse fan base, more viewers of color than they deserved considering the material they were being served. So where did the show go wrong? After a promising first season, establishing a kind of "X-Files" vibe, season two inexplicably began to diminish the presence of Abbie, Jenny, and Frank in favor of focusing on Ichabod's struggle to release his wife Katrina (Katia Winter) from evil forces. The arrival of Henry Parrish (John Noble, another fine actor wasted on the show) at first seemed a valuable asset for his knowledge of the supernatural. It didn't last long as it was revealed that Henry was in fact, the demon child of Ichabod and Katrina that he didn't know was alive. I'm not even kidding this was the storyline. Strangely, Parrish at one point disappeared for most of the season hold up in a hotel. But it was that type of random additions with very little direction and weight that continued to plague (there was an actual biblical plague in one episode) the series. Further sidelining the core characters - Ichabod, Abbie, Jenny, Frank - that we actually wanted to see. Then came Hawley (Matt Barr), Betsy Ross (Nikki Reed), Pandora (Shannon Sossamon), Joe Corbin (Zach Appelman, played the son of Clancy Brown's Sheriff August Corbin), and as you can tell the once celebrated racially diverse show suddenly became very white. The real travesty was that none of the additions ending up helping the show's narrative. Villains were passive-aggressive, monsters-of-the-week were easily defeated and forgettable, romances past and present were afforded to everyone but Abbie until she faded into the background. It's no wonder that by the end of season two Beharie wanted out. It's not the first time a 'Sleepy Hollow' actor was disgruntled. Jones too had been reduced to a periphery character even being arrested and committed to a mental institution at one point taking him out of regular appearances. He was vocal with his displeasure publicly, more so after he left the show. Katia Winter's Katrina was beginning to get more interesting and away from playing the constant victim, damsel-in-distress trope when she was revealed to be an evil witch. She was eventually killed off and her comments were more subtle about the way her character was used by the writers but recognized it was beyond her control. Beharie made it known that she wanted off the show and out of her contract. The network obliged planning then changing her original write off from a midseason death to the season finale. The death came at a time during the same week at least two other female characters from other shows were also killed off. Remaining fans of the show were not pleased. They went online to voice their outrage starting a hashtag #AbbieDeservesBetter and Beharie surely did. Her character wasn't developed as well as she could have been. While we got to see a wide circle of friends, lovers, and foes of Ichabod, Abbie had nary a friend despite the show being based in her hometown. Near the end the only hint of a romance, not the one we'd expect with Ichabod after Katrina's death, but an ex-boyfriend who happened to be her new FBI boss (Lance Gross). It came across rather sad instead of joyful only making her death all the more deflating. So what now? Why another season of diminishing ratings, cast turmoil and poor storytelling? The reason could be the lucrative chance at syndication. Another season gets the show to the magic number of 60+ episodes for syndication and streaming opportunities regardless if the show is actually any good this coming fall. It's the lowest rated veteran drama on Fox but they're doing their TV studio a solid by greenlighting another season even though it will probably continue to slide in the ratings. Disgruntled fans also started the hashtag #CancelSleepyHollow so Fox will have an uphill battle if it cares at all. Without the talent and charm of Beharie to play off of Mison, the very reason the show was special to begin with, I don't see how the show will find any relevance or an audience. Sleepy Hollow began with so much promise with leads that clicked on screen yet they squandered it all away. The loss of Beharie was the final nail in the coffin for a show that for intents and purposes died after season one.